Quick, tell me – how would you define a truly secure cloud application? Not sure? I’m sure it wouldn’t be hard to characterize Software-as-a-Service (SaaS) in general. Or its cousins Platform-as-a-Service (PaaS), Infrastructure-as-a-Service (IaaS) either. After all, most of us use some kind of cloud-based tool on an almost daily basis. Think Dropbox, Apple’s iCloud, Google Docs…and the list goes on. And that’s before we start considering enterprise applications – SAP, Google Analytics, Adobe Creative Cloud, etc. Everything is up in the cloud these days. But that still doesn’t answer our question – what makes a SECURE CLOUD application? Put another way, how do you know that the “as-a-service” tool you are using is trustworthy enough to keep all of your data secure? Of course, it might not be so critical if you’re talking about just storing or sharing pictures. But when it comes to data-heavy tools, like web analytics, a secure cloud application is definitely a must. Which means knowing how to define one is…well, kind of important. To break things down, let’s start with a list of basic things – think of the as the basic, telltale signs – that will identify a truly secure SaaS application. Since we’re focusing on web analytics, we’ll explore all of these areas from the perspective of an analytics platform, but many of them apply to other kinds of (enterprise and non-enterprise) applications as well. Start by figuring out where your data is stored. But it’s in the cloud, you say! Yes, except not really.. All clouds are actually somewhere on earth – in other words in the cloud vendor’s data center somewhere. The vendor may or may not have a way to access that data (a totally different topic altogether) but it is still physically located someplace. Secure data centers are fundamental to having a secure cloud solution. More importantly, the data center and all the data in it will be subject to the laws of the land regarding data usage, privacy and security. Before SaaS became popular, it was fairly easy to keep track of the rules you needed to follow. Doing business Germany? Follow German rules. Selling products in Canada? Follow Canadian laws. In other words – when in Rome, do as Roman laws command. Now – especially with web analytics tools that track visitors and sites worldwide – keeping up with regulations is a lot harder. Your customer may be in the US, but your analytics vendor may be storing your data in Switzerland. Different countries, different rules. Definitely something to consider when looking for a secure cloud analytics tool. One basic aspect of SaaS platforms is that they are exactly that – services. As such their users are given access to the tool, but that doesn’t necessarily mean the user controls it or the data in it. It goes without saying that control and security go hand in hand. What does this control mean exactly? As is clear from these points, having a secure cloud analytics tool not only means protecting data from hacks or inadvertent deletion, it also means protecting the data from corruption. Consider this: which is more harmful for a company selling enterprise-grade networking hardware tracking impressions and conversions from display ad campaigns? In both cases the company doesn’t have the information that it needs. Of course the first case entails even more serious consequences, especially if the company has been collecting linked or linkable personally identifiable information (PII) for advertising and marketing purposes. Which brings us to the next feature you should look for in a secure SaaS analytics tool. It doesn’t take a rocket scientist to figure out that first-party data is the most valuable for marketers and advertisers – and for anyone using web analytics. But if that information includes PII – an IP address, a name or address, records of past purchases – you could be in a tricky situation. Not only is this kind of information governed by strict laws – it’s also the kind of data that you would think twice about entrusting to a 3rd-party cloud vendor. Using PII for marketing and advertising purposes is only possible with anonymization. The answer is automatic anonymization of potentially sensitive data. This means that as soon as the data is collected and stored it given an anonymous ID, or in some other way changed so that it is still useful for analysis and for data activation or content personalization – but without the possibility of it being traced back to the data subject. As we’ve seen already, the issue of “security” can have different aspects – and it can be closely linked to data privacy. And, of course, this makes sense! Why? Because finding and using a secure cloud analytics tool isn’t only about protecting you as the tool’s user. It’s also about doing what’s good for your customers. Using a secure cloud analytics tool that respects visitor privacy builds the trust brands need to gain consent for data use. So along with the features that may be close to your heart – and good for your business – you should also keep an eye out for the features that will mean the most to the visitors to your website or app. The first two of these features are fairly obvious: visitors to your site will be glad that they can opt-out of being tracked or receiving marketing materials if they so choose. Giving them the option to not be tracked from the very beginning can contribute significantly to building brand trust. The last point deals more with access to your analytics data with your marketing or analytics team. But it also has a implications for privacy. Being able to segment the users of your cloud analytics into User Groups means you can honestly guarantee data subjects that their data is not shared with people who don’t need it. So now you have all the answers – right? But now that you know what separates a secure cloud analytics tool from others, you might want to think twice about some of those well-known platforms. One tool that meets all of these requirements – and more – is Piwik PRO Cloud Analytics. The Piwik PRO Cloud platform stores data in two data centers – both of which meet the highest standards for safety, environment stability and power continuity. For customers from the United States, data is stored in Manassas, Virginia while those in EMEA and Asia have their data stored in Frankfurt, Germany. Both facilities are maintained by LeaseWeb on servers dedicated exclusively to Piwik PRO. With options for storage in both locations, users of Piwik PRO Cloud can be sure that they remain in compliance with data regulations wherever they are located. One standout feature of Piwik PRO Cloud is that it operates on a basis of complete data ownership. In other words users are always in charge of what their data, how it is handled and stored. There is access to raw data with on-request data dumps. Backups are conducted at regular intervals which can be specified by the user. Access to backups is limited to pre-designated IP addresses which must be connected via a VPN. Data stored for Piwik PRO users is automatically separated from the frontend machine so that it is never connected directly to the internet. And one more thing – Piwik PRO never uses sampled data. Finally, there is privacy. Actually it shouldn’t be listed last on this list – because it is actually the point at which Piwik PRO excels the most. First of all, it is the only web analytics tool that has been exempted from the European Union’s cookie disclosure regulation. This means that the platform itself is judged to be privacy-friendly enough without any further disclosures needed. But on top of that, Piwik PRO offers Do Not Track and Opt-Out options that are built right into the system – including in its integrated Piwik PRO Tag Manager. This way users can ensure that not only the data collection done through their analytics is privacy-friendly, but also other tags, even 3rd-party ones, are made privacy friendly as well. Interested in learning even more about the security of Piwik PRO Cloud? 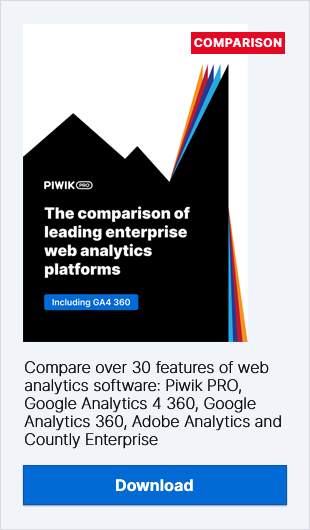 Find out what else makes Piwik PRO Cloud stand out among other SaaS analytics tools.